Summary: In 1945, Elsie Schmidt is a naive teenager, as eager for her first sip of champagne as she is for her first kiss. She and her family have been protected from the worst of the terror and desperation overtaking her country by a high-ranking Nazi who wishes to marry her. So when an escaped Jewish boy arrives on Elsie’s doorstep in the dead of night on Christmas Eve, Elsie understands that opening the door would put all she loves in danger. So far 2012 has been a terrific year for books. I honestly think that I've already read four (and maybe more) books that will go down as my favorites of the year and it's not even the middle of February. 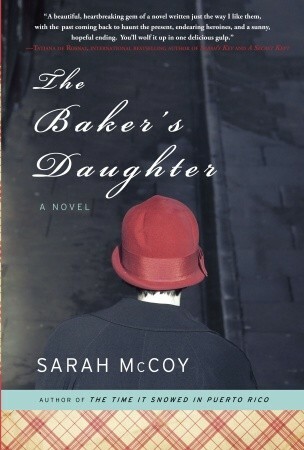 The latest terrific novel that I've completed is THE BAKER'S DAUGHTER by Sarah McCoy. I know I'm not alone in my praise of this book because book bloggers are just gushing over this story. In fact, I don't think I've seen a negative review. It's difficult for me to summarize THE BAKER'S DAUGHTER in just a few sentences (although writing book summaries is never a strength of mine.) Basically, it tells the story of two women -- Elsie, a woman who was a baker's daughter in Nazi Germany, and Reba, a bitter journalist who is writing her story. The story takes place in the present with Reba interviewing Elsie who now owns her own bakery in El Paso, Texas; however, there are also flashbacks to Elsie's life in World War II Germany. So I guess THE BAKER'S DAUGHTER is part historical fiction/part contemporary fiction. I say that because I think it will appeal to fans of both genres! On the surface, I was definitely interested in the description of THE BAKER'S DAUGHTER and I had a feeling that I would enjoy the book. However, I was almost surprised by just how much I liked it. This book had so many layers and was very complex -- in a good way. As I look back, it's hard for me to put my finger on just one or two really good things about THE BAKER'S DAUGHTER. Suffice it say that it all worked for me; and I think my favorites parts of the novel have changed every day that I've thought about this story. So I'm just going to mention in this review a few of the things that really stood out to me... as of today. First of all, I liked how the book went back and forth between present day El Paso, Texas and World War II Nazi Germany; and I thought the author did a great job of bringing the 1940s time period to life. I am a big fan of books that take place during World War II and especially Nazi Germany, but THE BAKER'S DAUGHTER actually provided a different look at this time period. Since Elsie and her parents were Germans living in Germany (as opposed to most books that I read that have Jews living in Germany), the novel showed their viewpoint of Hitler and the war. This novel demonstrated just how poor and hungry many Germans were when Hitler took power. There is no way that I can defend all of their actions, but this novel did made me understand how desperate the Germans were. However, I also learned some incredibly disturbing things about the Nazis that blew me away. I don't want to give to much away about the story, but Elsie's sister was part of a very scary child-rearing experiment that still makes me shiver every time I think about it. Another wonderful thing about this novel were the characters. As much as I enjoyed the various story lines, I thought the character development was fantastic. I found Reba to be so interesting (even when I didn't love her), and I liked how the author created so much of a background story for her. She was still dealing with the effects of a difficult childhood and her actions were almost self-destructive. In addition, I adored Elsie -- both when she was a teen as well as a mature woman. When Reba started asking her questions about her past, my heart broke for her as she was forced to dredge up so much information from her dark past, yet I also admired her strength and resilience. There were also some secondary characters that I found interesting. Elsie's daughter Jane made the story fun; however, it was Reba's fiance Riki that I found especially intriguing. Riki, who worked as a border guard in Texas, was a good man who was dealing with quite a few issues. Not only did he have problems with Reba's commitment to him (I did mention that she was dealing with some major baggage from her childhood! ), but he was having second thoughts about his career choice. I thought Ms. McCoy did a very good job with bringing to light some of the controversial (and very sad) aspects of illegal immigrants in the United States through Riki's personal journey. And lastly, one of the most impressive things to me was how well the author tied together the past and present. On the surface, I enjoyed how the novel went back and forth through Elsie's stories, and I thought Ms. McCoy did an excellent job with the transitions. But I was also impressed on a much deeper level with how the author made me think by juxtaposing the two time periods and the two main female characters. While it first appeared that Elsie and Reba were very different and lived in very different times, as their stories were revealed, I appreciated how their lives and feelings were quite similar. However, I really liked how the author juxtaposed the situations of the Jews in Nazi Germany with the illegal immigrants in the United States. It actually gave me quite a bit to think about.. and hopefully talk about. THE BAKER'S DAUGHTER would make an outstanding book club discussion. There is a fantastic reading guide on the author's website with twelve thought-provoking questions, but there are also some book club activity suggestions such as asking each book club member to bring a family recipe. (Did I forget to mention that this book has huge food themes? That's another one of my favorite things about it.) Another fun idea is to have each member bring one of Elsie's recipes from the back of the book. There are also tons of topics to discuss including Nazi Germany, illegal immigration, love, parent/child relationships, secrets, sacrifices, female empowerment, blind submission, and guilt. I am so excited to say that, in a few weeks, I will be attending a luncheon with Sarah McCoy at Aaron's Books in Lititz, PA. I have tweeted a little bit with Ms. McCoy and she seems so nice. I'm curious to hear what she has to say about writing this beautiful novel, but I'm also just thrilled to meet her! THE BAKER'S DAUGHTER is sure to be huge especially with book clubs. It's a wonderful story with wonderful characters and it's not to be missed! Oh, your lunch with Sarah is sure to be great fun! She's a Hokie, you know! I just bought this book yesterday and can't wait to read it. So many raves for this book! I can't wait to hear her speak at the luncheon! I'm sure I will love this book. Oooh, I can feel a nationwide Sarah McCoy wave building up here! I loved this book too. That Lebensborn Program really fried my brain cells. I brought it up at my book club (where we were discussing another WWII novel) and nobody had ever heard of it! But it doesn't surprise me either. I am thrilled for Sarah McCoy that she has really knocked it out of the park with this one. You did a fantastic job with this review. It is a surprising complex book that touches on so many topics it's a natural for discussion. I know you'll love your lunch with Sarah. I so wish I could be there. I have had this on my reader for a while now. Kind of wish I had already read it now that I am seeing all these fantastic reviews of it. Maybe in the next couple of weeks. Enjoy your lunch with the author. It sounds like a fabulous event! This sounds like a wonderful read. I will try to convince my book club to read it this year. Love that it has tons of food references. Great review! Have fun at your author lunch. I`ve just got my copy of this book and I also can`t wait to read it, it sounds like a real jem. Have to agree that so far this has been an amazing year for great books! I cannot wait to read this book later in the month. I've heard such rave reviews of this one...Thanks for the review.